Figuring out what to do on a date is tedious, annoying, and tiresome. If you’re the one always expected to come up with date ideas then look no further. A great opportunity for a fun date that she won’t see coming is probably within an hour of where you live at any given moment. 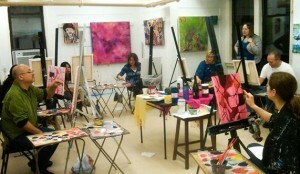 Painting classes for adults are gaining popularity, and most classes are filled with women. Take her to a painting lesson for a fun and unexpected night that the two of you will remember forever. By doing a basic search online for painting classes, you can turn up countless results. The types of classes that are most common are ones that usually take place at night in which the group of “students” all paints the same subject. It teaches fundamental color principles and composition, while also being catered towards adults. Arguably the best part of the entire “adult” part of the painting experience is that generally there’s a B.Y.O.B. (bring your own booze) policy at some classes. So, not only do you get to paint a picture with other people and have fun, but you also get to drink while you do it. The classes are relatively inexpensive (no more expensive than a nice dinner for the two of you), so it’s accessible as a date spot for anyone. If paint quality is an issue for you, then go ahead and spring for a more expensive painting class. Lower priced classes will use a cheaper grade of paint, usually acrylic, with higher water content. This makes the paint less opaque, which can be annoying for beginners, not to mention difficult to work with. The paint also won’t hold up as well over time, so if you want a piece that lasts till ages, go ahead and go to the expensive class. While you’re there, the painting you make is something that you can take home, so you want to be sure it lasts at least a little while. If you two are good artists, then what you created can make a great art piece to hang on the wall. If you aren’t then it makes something hilarious for the two of you to bring out from time to time. It’ll bring back the great memory of the fun you had painting with her, and you two can laugh over and over again at your botched attempt at painting even something as simple as a tree or a pear. She’ll be completely blown away at your unique date idea, and she’ll be sure to brag to all her friends afterward. Even though painting classes are generally for artists, everyone can participate in these fun activities no matter what their skill level is. It’s just for fun, so don’t worry if you screw it up. If anything, it’ll just make her happier and will give her a reason to stay laughing the whole night. There’s nothing more amusing than going out and doing something stupid, and she’ll remember it always.